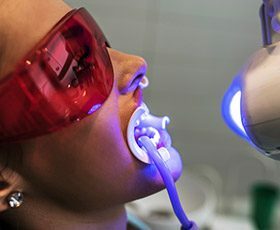 Cosmetic Dentist serving Washington, D.C.
At Davidson Dental Associates, we want our patients to enjoy stunning smiles that help them make excellent first impressions on everyone they meet. That’s why Dr. Davidson and her team of dental experts offer a wide variety of cosmetic services that can repair chips, cracks, dental staining, and other frustrating flaws. Our goal is to create results that are minimally invasive, functionally aesthetic, and built to last for many years to come! Please contact our Washington, D.C. location today to schedule a consultation, or if you have any questions. 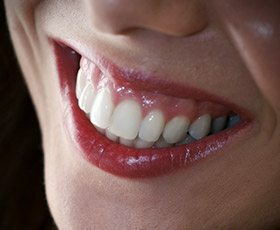 Porcelain veneers and Lumineers are both ultra-thin restorations that are crafted from high-quality porcelain and designed to fit over the visible surfaces of requested teeth. 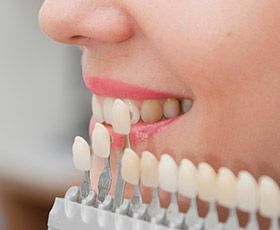 With a custom-made veneer, it’s easy to transform your smile’s appearance in a comprehensive fashion over the course of just a few appointments. 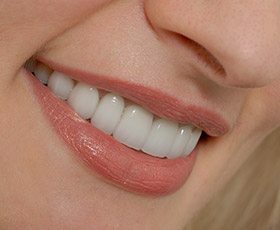 Traditional veneers are extremely lifelike, but they do require some of the natural tooth’s enamel to be buffed away for accommodation; Lumineers are even thinner (only the width of a contact lens) and can be placed without this permanent alternation, but some patients feel that they’re not quite as attractive. Our team will be able to go over both options with you in greater detail so that you can choose the one that best fits your personal preferences and goals. If you’re looking for fast and effective ways to treat small smile imperfections, direct bonding may be the right treatment option for you. This type of care should only require one appointment of your time, during which our team will apply lifelike composite resin to the requested tooth and sculpt it into an addition that hides the gap, stain, or chip from view. Restorative solutions like dental crowns, inlays, and onlays don’t have to be made from dark-colored metals. Instead, Davidson Dental Associates can help you rebuild your smile seamlessly! We offer attractive ceramic materials that are precisely matched with your existing tooth enamel for the most attractive possible outcome, as well as composite, zirconia, and other great options. This type of restoration will also be free of temperature-sensitive metals and 100% biocompatible. Are you unhappy with the current color of your teeth? Are stains or discoloration taking away from your confidence and enthusiasm? We’d love to introduce you to ZOOM! Whitening here in Washington, D.C. This in-office service can provide beautifully dramatic improvements, improving the shade of tooth enamel up to 5 shades in the span of a single appointment. Our at-home teeth whitening kits are a big improvement when compared to the whitening products found on the shelf at your local pharmacy. You’ll be provided with professional-strength bleaching gel and customized oral trays, as well as detailed instructions for use. The patient’s only job is to wear both components for a prescribed amount of time each day whenever their busy schedule allows. After a few weeks of regular use, your smile should be noticeably brighter. Does your smile look excessively short or uneven? Would you characterize its appearance as “gummy?” An excess of soft tissue can cause both aesthetic and restorative concerns, keeping plenty of beautiful dental structure unnecessarily hidden from view. Thankfully, our practice offers gum recontouring as a solution! During this procedure, our goal is to remove unnecessary gum tissue and correct any symmetrical concerns as well, resulting in a much more attractive and natural gum line. You may be interested in achieving a straighter smile, only to shy away at the prospect of wearing noticeable metal braces. 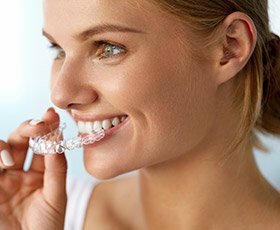 Many of our patients prioritize their polished appearances for professional reasons, which is why our office features an orthodontic alternative that’s much more image-friendly – Invisalign clear braces. 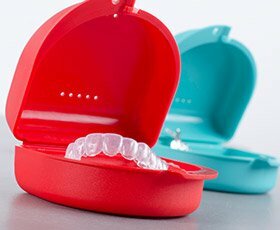 Invisalign treatment features a series of clear, subtle aligners that will gradually shift teeth towards their desired positions.